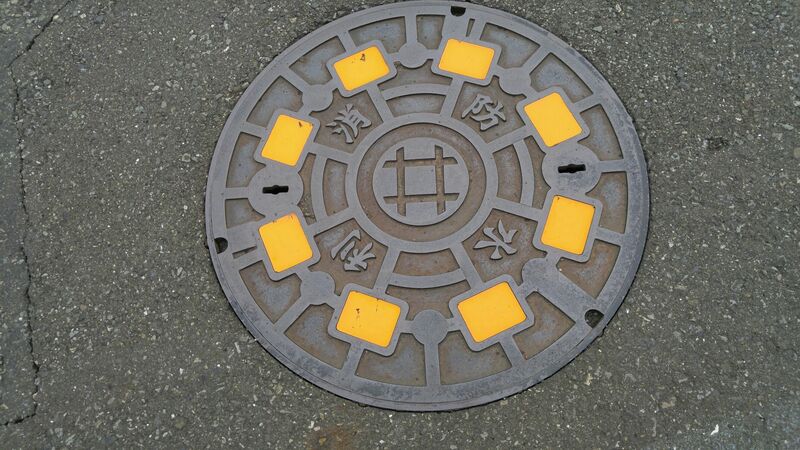 Manhole Covers in Shizuoka Prefecture 50: New and Old Fire Hydrant and Fire Cistern Covers in Shizuoka City! 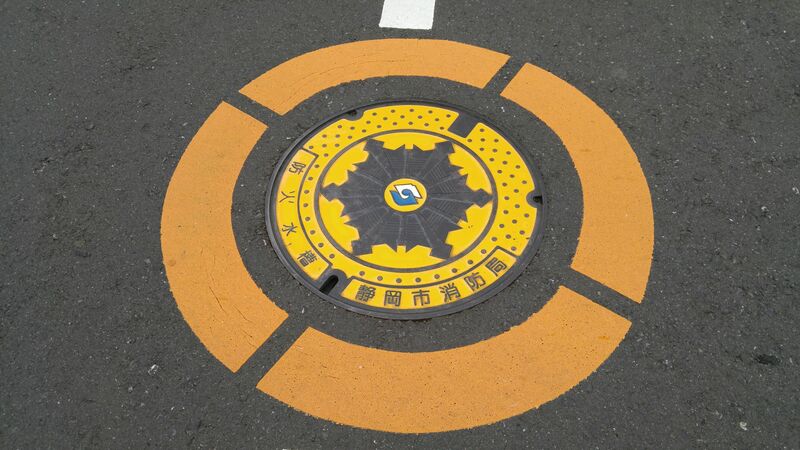 if you walk or cycle along Showa Street in Aoi Ku, Shizuoka City, near Ichi Ban Cho you will find a series of old and new fire hydrant and fire cistern manhole covers with an interesting geometric design! 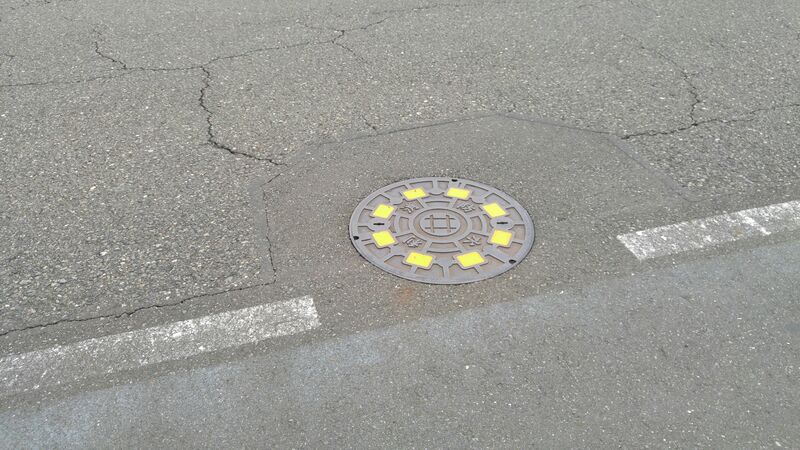 This particular ones is surrounded in yellow to allow fire trucks to easily spot them! It is actually the cover over an important access to a fire cistern! 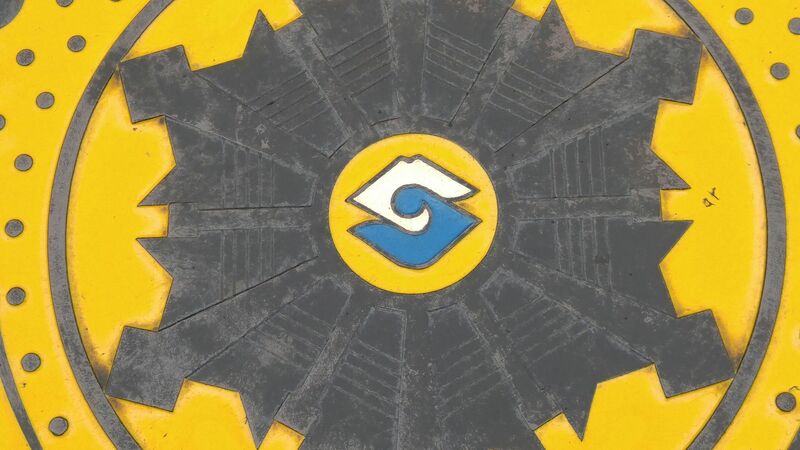 We know the design is brand new as it features the new Shizuoka Ciy emblem in its middle! Going back you will find this still fairly modern design on a fire hydrant cover! 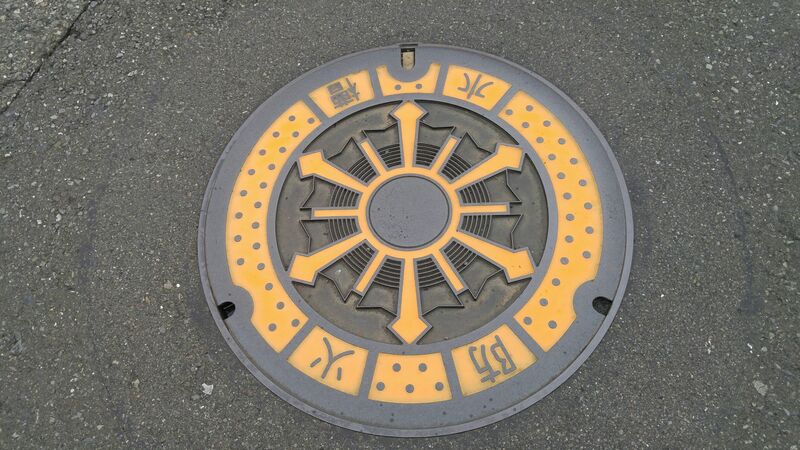 As they erased the central design it is probably a type used in the whole prefecture! Further down the road you will find an old design! 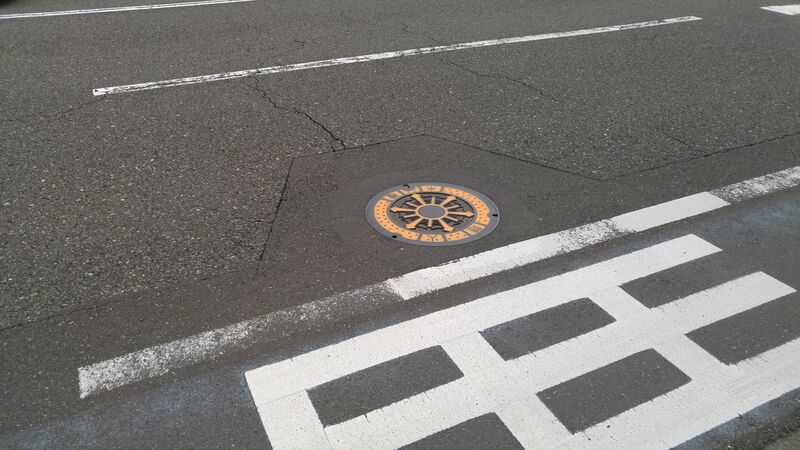 It is partly painted in yellow for easy spotting at night. 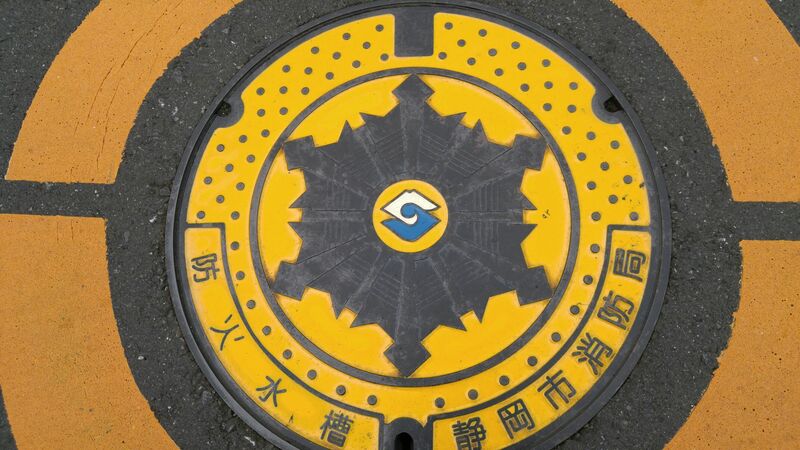 This a type used in the whole prefecture and probably beyond! 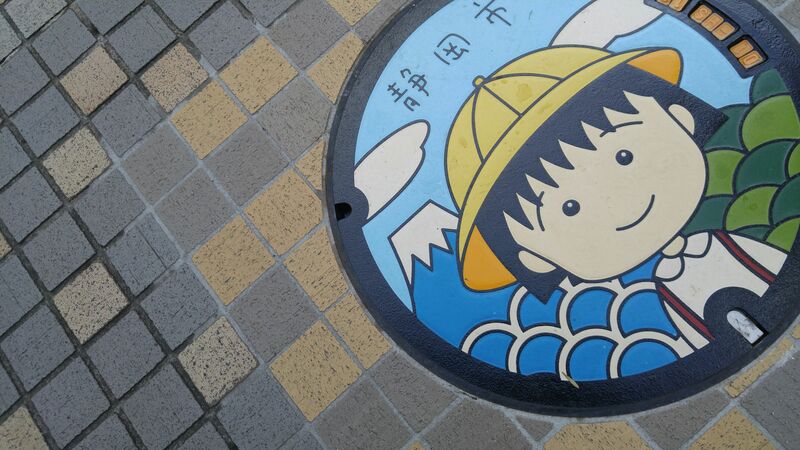 Manhole Covers in Shizuoka Prefecture 49: Chibi Maruko in Shimizu Ku & Aoi Ku in Shizuoka City! 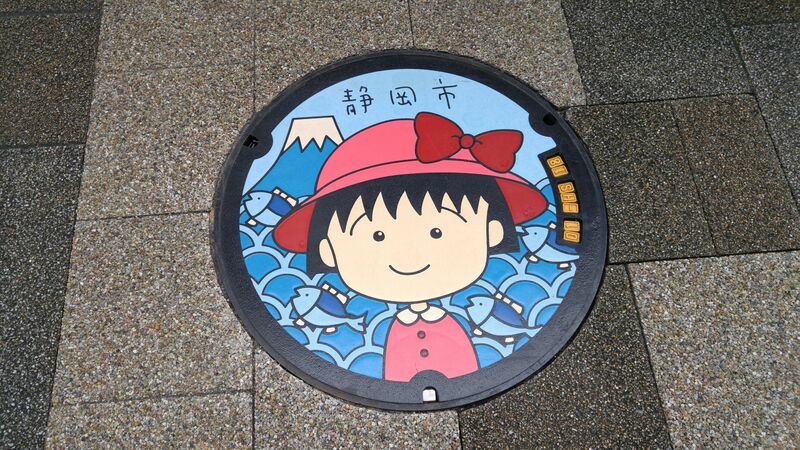 Chibi Maruko is the heroine of the Chibi Maruko Chan manga series known all over Japan and far beyond overseas. 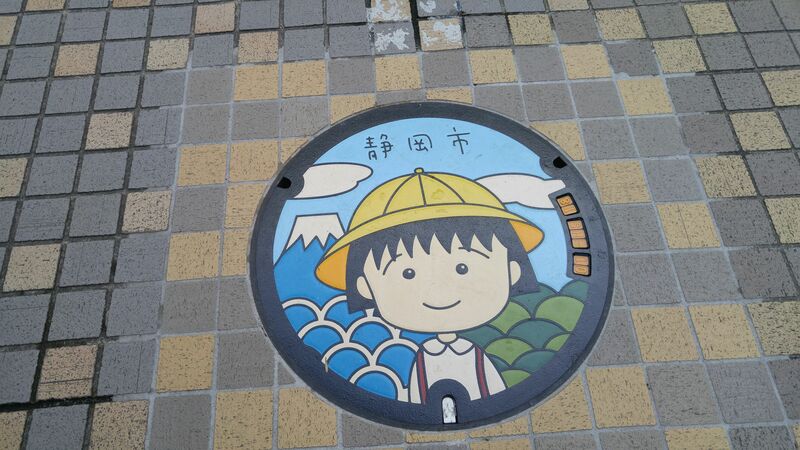 It was created by Momoko Sakura, born miki Miura(8 May 1965 – 15 August 2018), a resident of Shimizu Ku (formerly Shimizu City) in Shizuoka City. 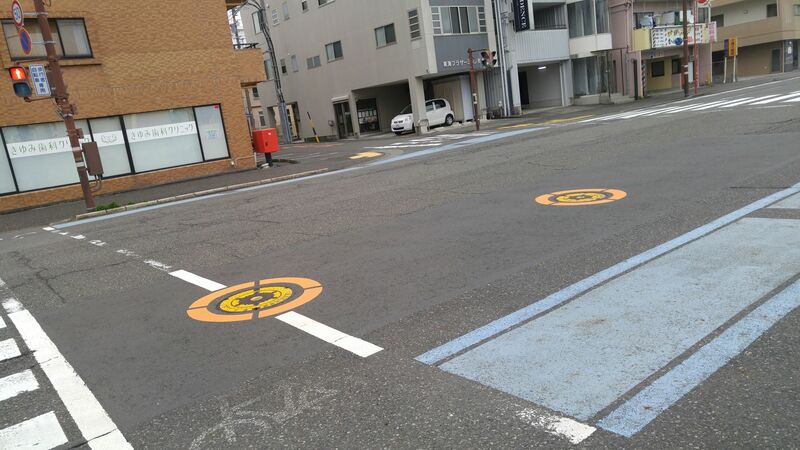 By sheer coincidence the laying of thetwo new and unique manhol covers had been delayed and were installed just after the sudden death of artist. 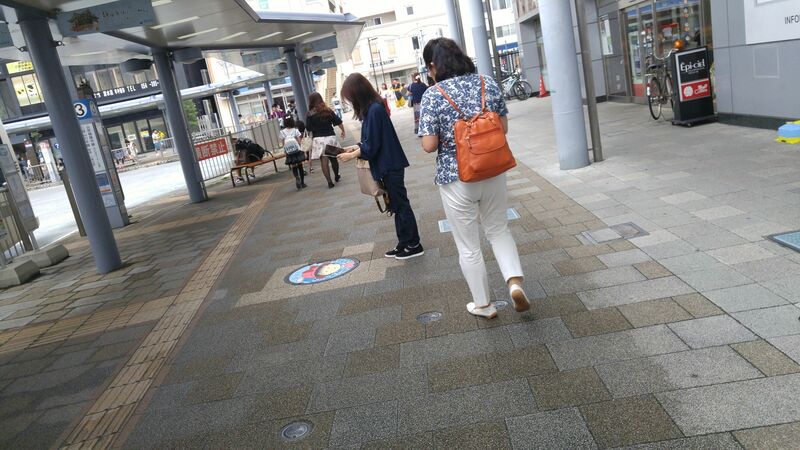 The first was laid on Sptember 6th in Shimizu Ku just in front of the west exit of Shimizu JR Station. Chibi Maruko wears a pink holiday outfit on this one. The background features Mount Fuji which you can see from Shimizu JR Station by clear weather. 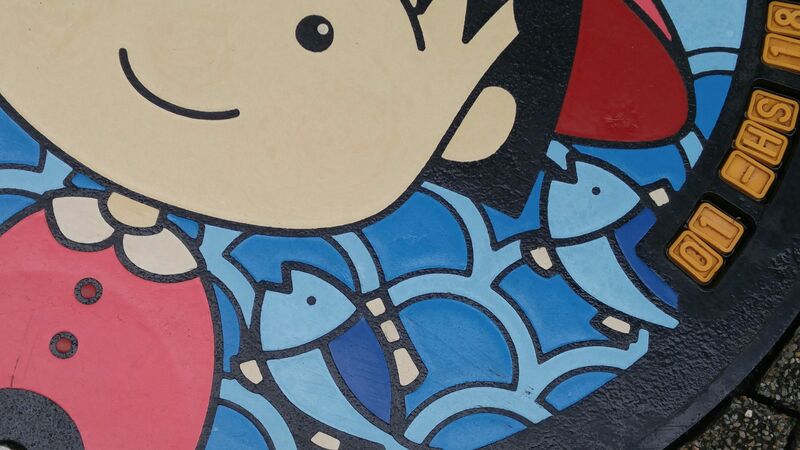 Also in the background are tuna and the sea as Shimizu is a major fishing harbor with the largest tuna haul in Japan! 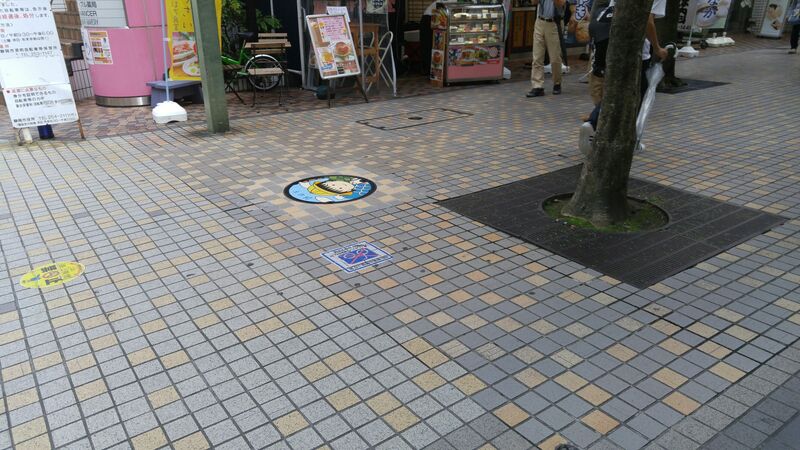 The other one was laid on September 7th at the entrance of the waking alley behind Cenova Deppartment Store in Aoi Ku! 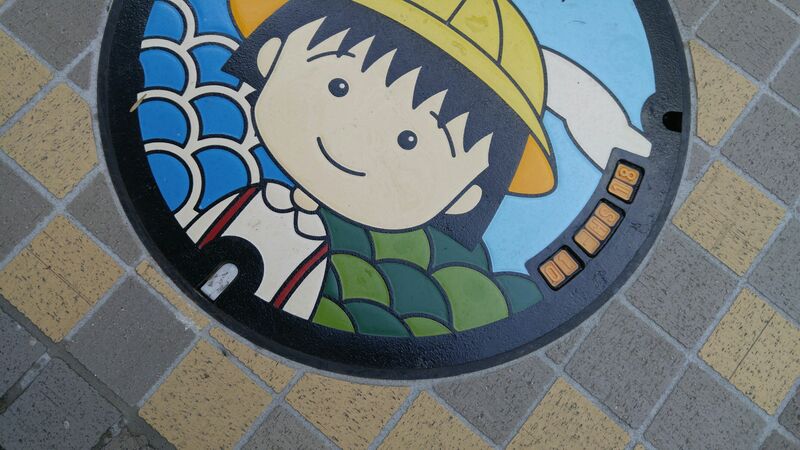 It represents Chibi Maruko in her primary school uniform and headwear! 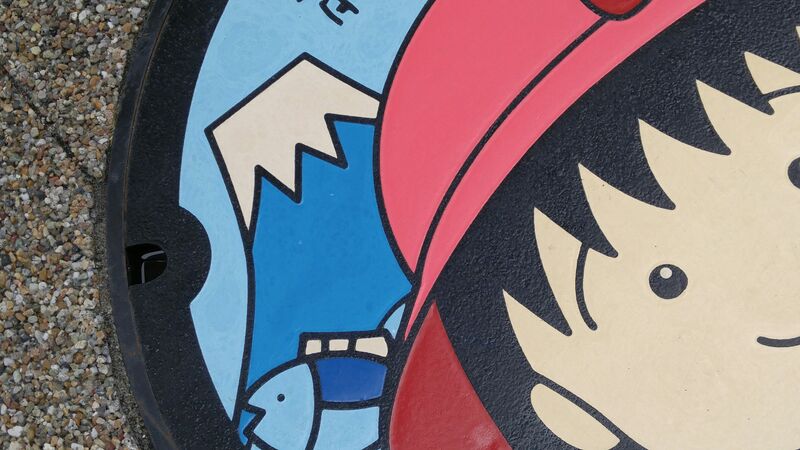 The background shows Mount Fuji and the Abe River! And the tea fields, for which Shizuoka is so famous!